Lechery & Indifference, originally uploaded by J Hutchins. Ed. Note: I didn’t have a photo of the firehouse at Newton so just picked a random one from flickr. Regarding the firehouse at Newton, I too have seen random people hanging out and setting up a small portable bbq and wondered if it was sanctioned by the firehouse. I wanted to raise the issue of loitering in front of the firehouse on 14th and Newton streets, as it’s caused a great deal of frustration for the residents of Newton and certainly beyond. 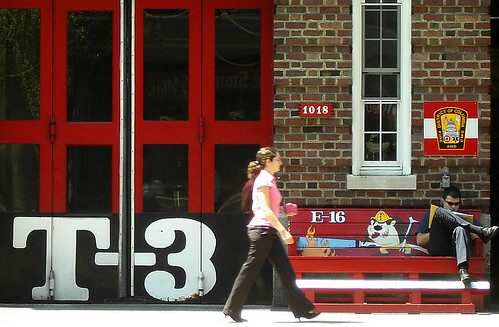 Those familiar with this spot know that there used to be benches in front of the firehouse, a beacon for all types of characters. Generally, these people are unruly, intoxicated, offensive and pretty insensitive to anyone around. Jim Graham had the wood benches removed last year, but the cement structures of the benches remain, and now the regulars have taken to bringing their own furniture in the form of lawn chairs, desk chairs, etc. It’s easy to write these folks off as “homeless”, however, it’s become pretty obvious that they do have homes. They park cars along the curb of 14th St. and blast music; if it’s nice out you bet they’re grilling (that’s right they have a grill and meat to cook), and after they leave the entire area is a disaster. Trash is left everywhere as well as items that apparently aren’t worth holding onto. We started by contacting the firehouse. The gentleman who was apparently in charge, asked if we were referring to “Bumfest”. That’s right, this is a civil servant. The obvious indifference to members of the community and apathy towards the situation outside of the firehouse is pretty frustrating considering we care about our neighborhood. Most of these firefighters are from other states, and seem to care less about the immediate community. Councilman Graham has expressed repeated frustration to his constituents, but there’s no loitering law in DC, and police claim they can do nothing. I find it hard to believe that if my friends and I decided to congregate on the sidewalk and grill, start fights, curse out passersby, puke, and trash the area, we wouldn’t be punished in some way. It’s really embarrassing to have the first site visitors see on your street be a group like this.